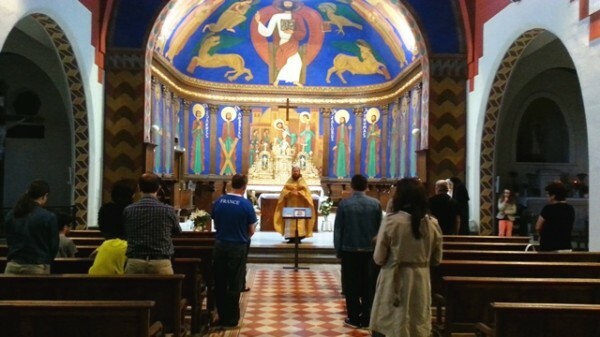 October 18, 2014 – The Divine Liturgy was celebrated in Valance, department of Drome, France, at numerous requests of Orthodox town people and with the blessing of Bishop Nestor of Chersonese. The Sacrament of the Eucharist was celebrated in the Catholic church of St. Peter, the First Apostle, offered to the Orthodox community in Valance by the local Catholic diocese. Worshipping at the church were émigrés from Russia, Ukraine, Belarus, Moldova, Serbia and Syria. The liturgy was celebrated by Hieromonk Joseph (Pavlinchuk), diocesan secretary for pastoral care of the Moldovan diaspora, and Hieromonk Nikodim (Pavlinchuk), rector of St. Seraphim’s in Montgeron, the website of the Diocese of Chersonese reports.